It’s now official, Santa's reindeer live in County Durham. (WELL FOR EVERY NIGHT EXCEPT CHRISTMAS EVE THAT IS!) Rent a Reindeer has the largest breeding herd of Reindeer in the North of England. Some of the Reindeer are on display to the public in October, November, and December at Richardsons Garden Centre, when their centre is transformed in to a Christmas extravaganza with decorations, lights, trees and grotto. They also get out and about when hired to other Garden Centres, Museums, stately homes, shopping centres, city centres, towns and villages for Christmas fetes, grotto openings, sleigh pulls, weddings and photo shoots around the country. You never know you may even see them in a movie or TV program. 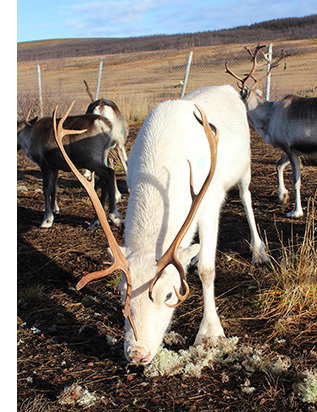 You could even adopt one of the Reindeer and along with a Birthday card, Christmas card, adoption certificate and fluffy reindeer toy you also get to come with the family and feed the reindeer twice in the year when the reindeer are not on public display. (Prior appointment needed) Just fill in our adoption form. You will be able to pay by via paypal. All of our reindeer and handlers are fully trained as well as been fully insured and have all the relevant licenses and paperwork that is involved in the display and handling of performing animals, all of our handlers are in smart practical uniforms which shouldn’t look out of place in your display. We can cater our displays generally around what you may want with either moving and static displays or a combination of both. We generally have 2 or more deer involved in the display with or without our genuine Norwegian sleighs. We can even supply Santa if needed. Reindeer always create a lot of good PR for your event, think of all that free publicity that can be created. The media both paper, tv and social networks all take an interest when reindeer and christmas are mentioned. Our animal welfare is of the upmost importance to us so the more details you can provide to us when enquiring the more it helps us with your event. We are also involved with a dedicated breeding program with our reindeer, with young born in the summer and out with the mums in the Christmas period. We are founding members of the British Reindeer Herders Association that has Reindeer breeding, displaying and welfare at its core.